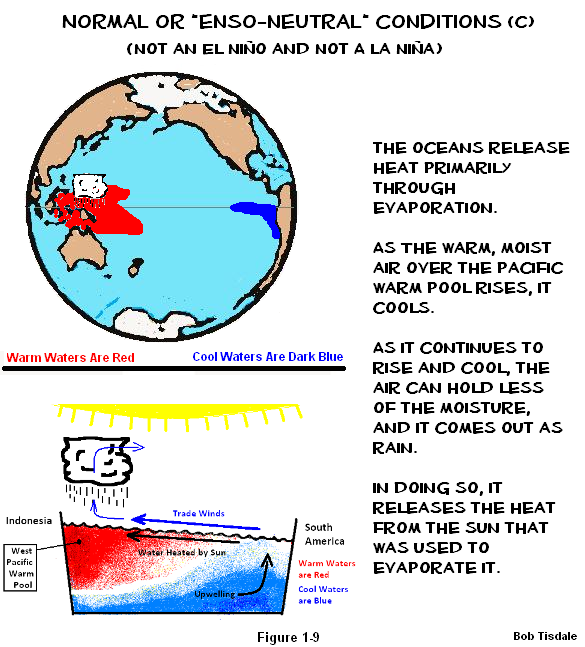 El Niños and La Niñas are parts of naturally occurring, sunlight-fueled processes—amazing processes—that produce warm water and redistribute it from the tropical Pacific. When I was first able to fathom the processes, when they finally clicked for me, I was in awe of Mother Nature’s handiwork. Cloud cover, sunlight, ocean heat content, sea surface temperatures, sea level, surface winds, ocean currents, etc., all interwoven, all interdependent, with the events occurring at massive scales. I’ve been sharing their complexity, magnitude and aftereffects ever since. Hopefully, this post will allow you to gain some insight–or spark your interest. 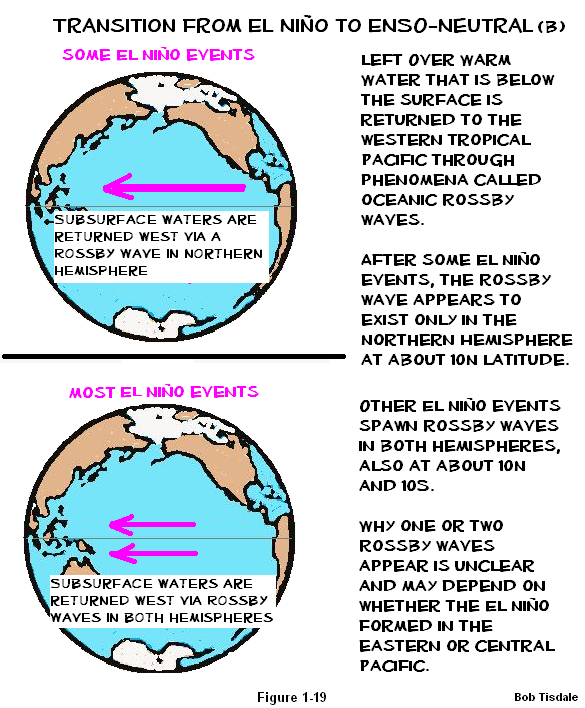 El Niño and La Niña events are extremely important parts of Earth’s climate. They are the dominant mode of natural climate variability on annual, multiyear and decadal timeframes. El Niño and La Niña events impact everything from drought and rainfall to surface temperatures around the globe. Consider this: El Niños and La Ninas occur in the tropical Pacific, but more than a decade ago it was determined that they rearranged sea ice in the Southern Ocean surrounding Antarctica. Recently, they were even linked to temperature of the water below the Antarctic sea ice, through changes in ocean wind patterns. See Dutrieux et al. (2014) Strong Sensitivity of Pine Island Ice-Shelf Melting to Climatic Variability and the corresponding ScienceDaily article here. The following is Section 1 from my ebook Who Turned on the Heat? 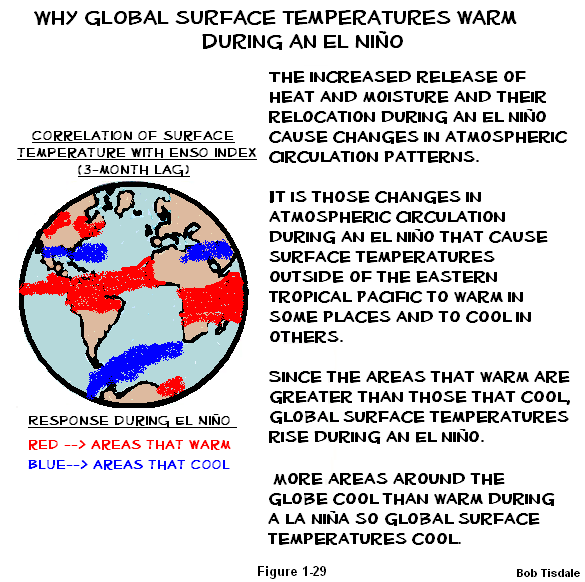 This presentation was created to fill the gap between overly scientific texts and the basic (but way too simple) descriptions of El Niño and La Niña processes that are available on the internet. As I noted above, hopefully, it will help you to understand those seemingly complex processes. Please ask questions. Notes: I’ve struck through text from the book (strikethrough) where it refers to other sections of the book, and I deleted a short note that refers to a feature of Abobe readers (the book is in pdf format). This post contains 29 illustrations, so it may take a little while to load. If they don’t appear full-sized, just give them a click. Most introductions to the El Niño-Southern Oscillation (ENSO) on the web include boiler-plate descriptions and three illustrations: one each for El Niño, La Niña and ENSO-neutral phases. The reader has to jockey back and forth, scrolling up and down, to read the text and compare it to the illustrations. Unfortunately, much of what’s discussed in the text of those ENSO introductions isn’t shown in the graphics. To overcome that, I’ve prepared a 29-cell series of annotated (cartoon-like) illustrations that first introduce readers to background information about the Pacific Ocean. 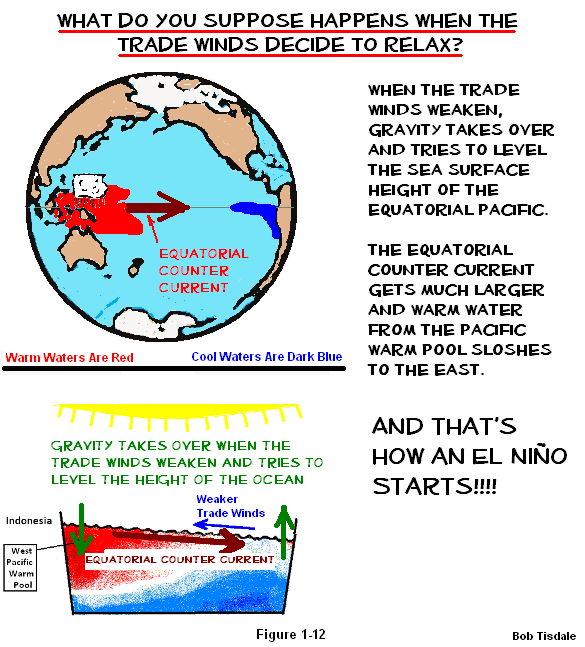 There are also introductions to trade winds and ocean currents, both of which have important roles in ENSO. 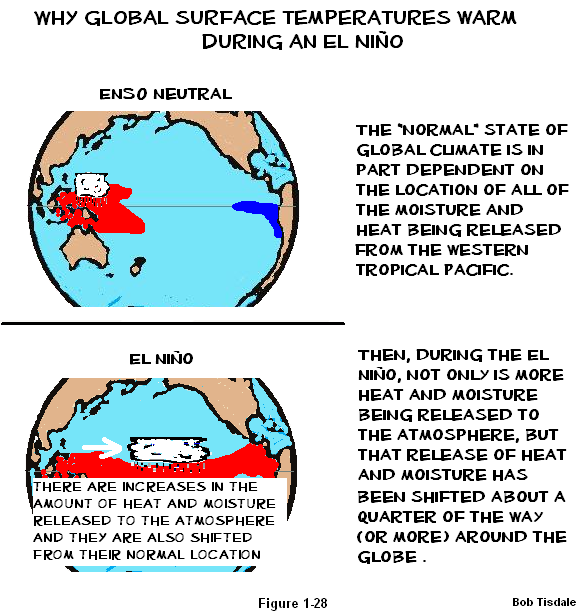 With multiple cartoon-like illustrations for each phase and the transitions between them, the reader is taken through a complete cycle of ENSO phases: ENSO neutral to El Niño, back to ENSO neutral, on to La Niña, and then back to ENSO neutral. At each phase, the interaction between sea surface temperatures across the tropical Pacific, trade winds, sea surface height, precipitation and subsurface ocean temperatures are illustrated and discussed. Also presented are the differences between El Niño and La Niña events and the reasons why global surface temperatures vary in response to ENSO events. To reinforce and confirm what’s presented in this section, Section 3 includes more-detailed, data-reinforced descriptions and illustrations. Now’s a good time to take a quick break from the cartoon-like illustrations. We’ll go into more detail in Section 3 about the interrelated processes taking place before an El Niño, but it’s important now to reinforce what’s been discussed so far. I’ll reword the presentation a little with hope that it will help make things click for you. The trade winds are an important part of our discussion of ENSO-neutral, or “normal”, conditions in the tropical Pacific. 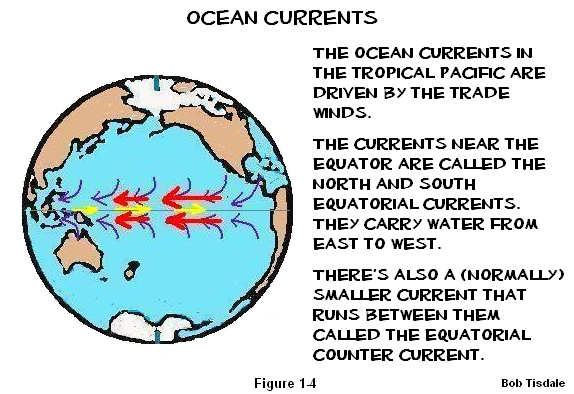 They blow from east to west across the surface and cause the surface waters to also travel from east to west. That makes sense. If you blow on a liquid long and hard enough, the surface of the liquid will move it the direction you’re blowing. The trade winds also blow clouds toward the west. That’s not hard to imagine, either. This allows that wonderfully strong tropical sun to beat down on the surface of the tropical Pacific and to reach into the subsurface waters to depths of 100 meters. Though most of that sunlight is absorbed nearer the surface, in the top 10 meters (roughly 33 feet) or so, it does reach farther. All of Mother Nature’s glorious sunlight warms the tropical Pacific waters as they travel west. 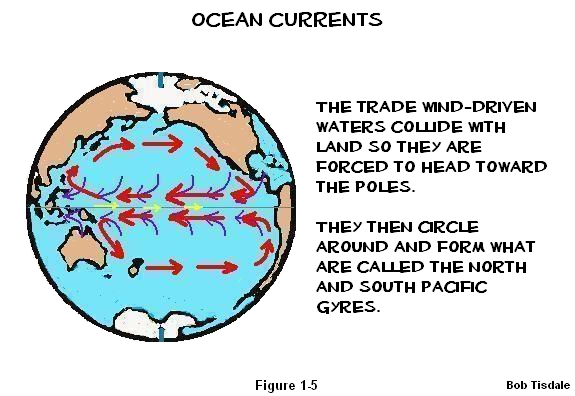 The trade winds push the waters up against the land masses of Indonesia and Australia. This causes the warm water to, in effect, pile up in the western tropical Pacific, in an area called the west Pacific Warm Pool. The trade winds driving the westward movement of surface waters also draw cool waters from below the surface of the eastern equatorial Pacific, in a process called upwelling. That upwelled water provides a continuous source of cool water at a relatively constant temperature that’s then warmed by the sun as it travels west. 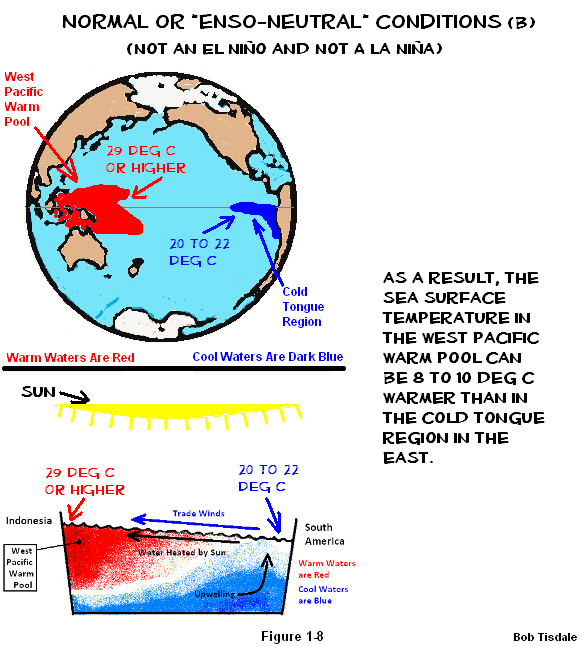 The water is, therefore, cooler in the eastern equatorial Pacific, in an area called the Cold Tongue Region, than it is in the west Pacific Warm Pool. 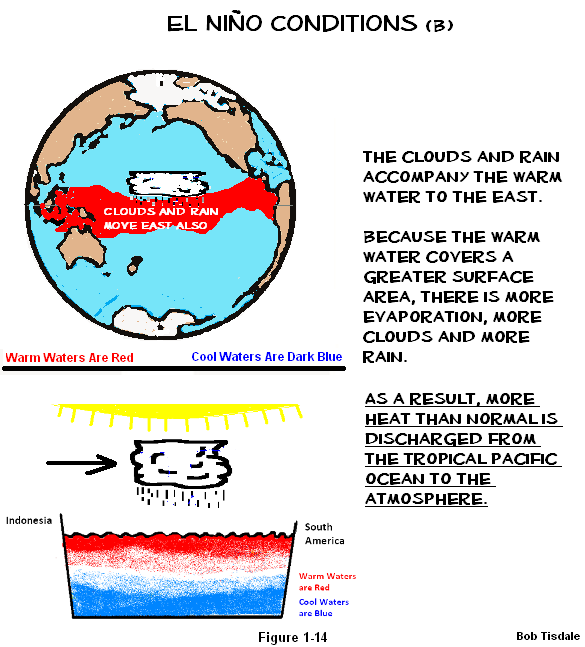 Remember, the tropical Pacific stretches almost halfway around the globe, so that nice cool supply of water in the east travels a long way under the tropical sun before it reaches the warm pool in the west. 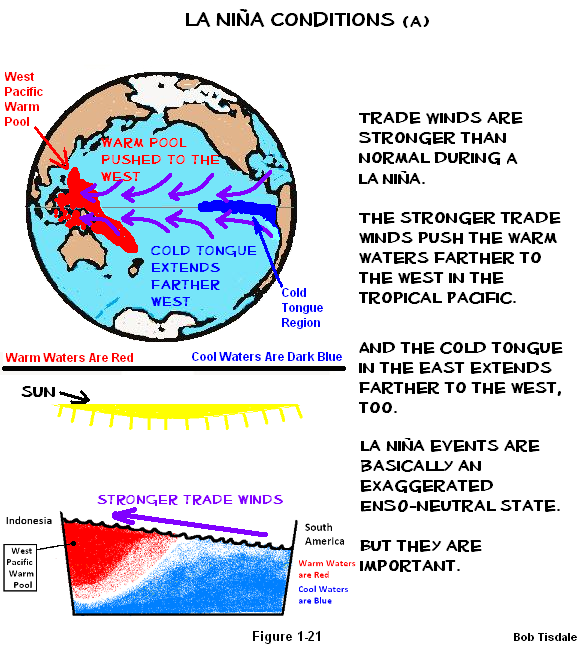 The trade winds cause the temperature difference between the east and west portions of the tropical Pacific. Now, here’s the interesting part. 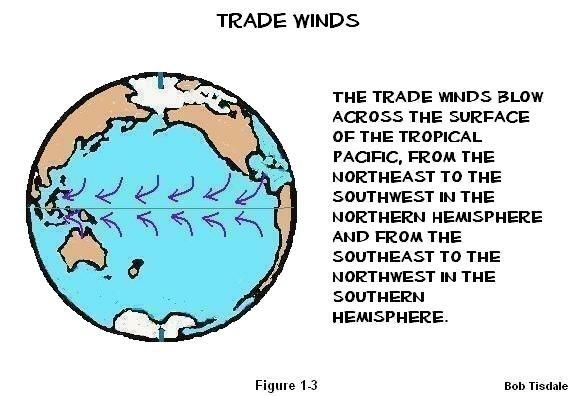 The temperature difference between the eastern and western tropical Pacific causes the trade winds to blow. That’s right. The temperature gradient of the tropical Pacific sea surface temperatures and the trade winds interact with one another in a positive feedback loop called Bjerknes feedback. There nothing mysterious going on. 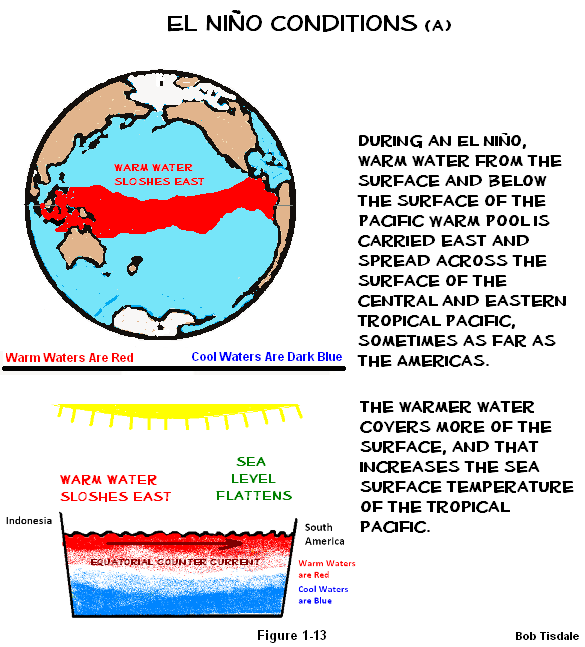 The warmest water is in the western tropical Pacific. We’ve discussed that, and we’ll confirm it in Section 3. The warm water there heats the air above it, and that relatively hot air rises. All of that rising hot air has to be replaced by other air, and it’s the trade winds out of the east that supply the necessary make-up air. Because the tropical Pacific is cooler in the east, the air sinks there, and eastward-blowing upper winds complete the circuit. Overall, the warm air rises in the west; it cools as it’s carried east by the upper winds; then it sinks in the eastern tropical Pacific, where it heads back to the west as the trade winds. That circuit is called a Walker cell. 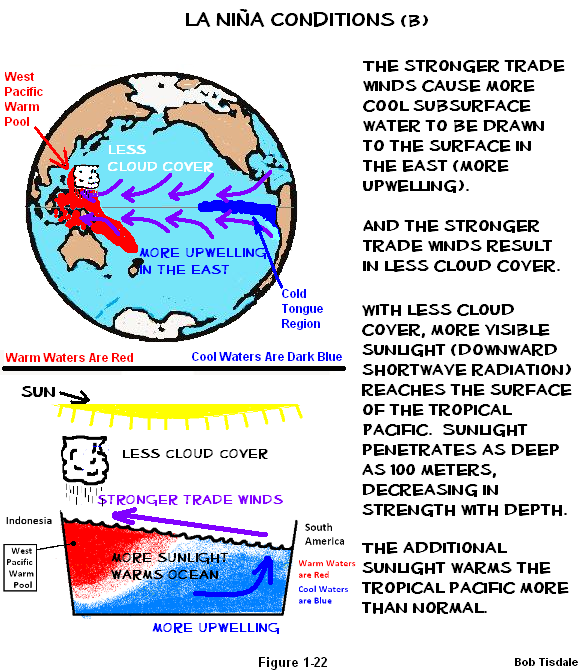 The trade winds continuously push cool water from the east to the west, sunlight warms the water as it travels west, and when that warm water reaches the west Pacific Warm Pool, it supplies the heat necessary to maintain the updraft, which, in turn, causes to trade winds to blow. 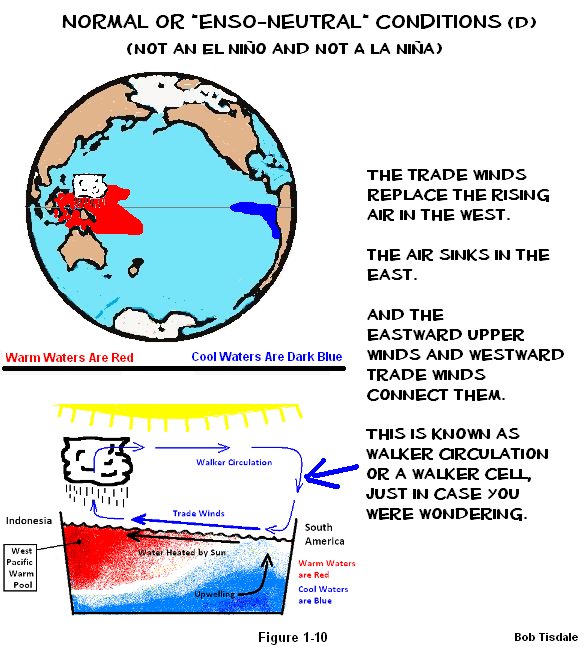 The briefest way to explain it: the trade winds and the sea surface temperatures are coupled, meaning they interact with one another. 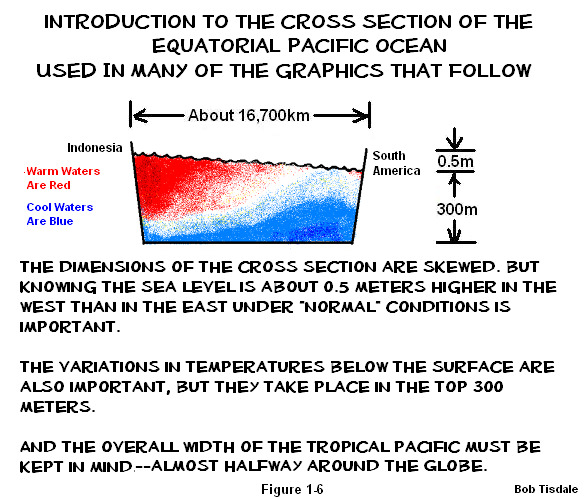 With all of that warm water being piled up in the western tropical Pacific, and with all of the cool water being drawn from the eastern equatorial Pacific, the surface of the water—the sea level—in the west Pacific Warm Pool is about 0.5 meters (approximately 1.5 feet) higher in elevation than it is in Cold Tongue Region in the east. Everything’s in tune, running in its normal state. 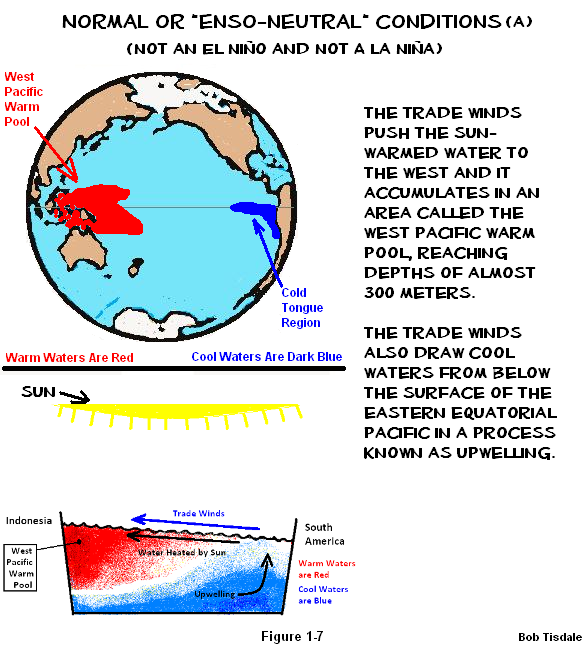 The temperature difference between the east and west keeps the trade winds blowing—and—the trade winds maintain the temperature difference between east and west—and—the trade winds keep the warm water in the west Pacific Warm Pool at a higher elevation than it is in the eastern equatorial Pacific. We can’t forget about gravity. It’s always there, our constant companion. Gravity would like the sea surface height in the west to equal the height in the east. It likes level playing fields. It’s working against the trade winds, and the trade winds are piling up the warm water against gravity. Still, everything is in relatively constant state of balance, with little gives and takes here and there. Then some weather event—and that’s precisely what it is, a weather event or group of weather events—causes the trade winds to relax. That means the coupled ocean-atmosphere processes taking place in the tropical Pacific are no longer in balance. Sometimes, the weakened trade winds aren’t strong enough to hold the warm water in place in the west Pacific Warm Pool against gravity, so gravity takes over and all of that lovely warm water that was piled in the west Pacific Warm Pool suddenly sloshes to the east. That’s how an El Niño starts. I’m now going discuss parts of the process that haven’t been shown in the illustrations yet. 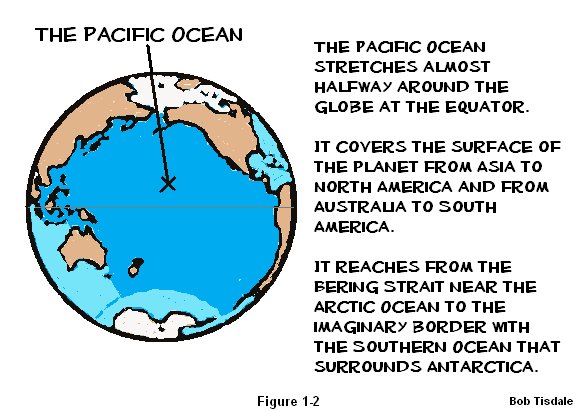 The Pacific Ocean is awfully wide at the equator, so it takes a while, about 2 months, for the warm water to slosh to the east as far as the coast of South America. Let’s put things into perspective. 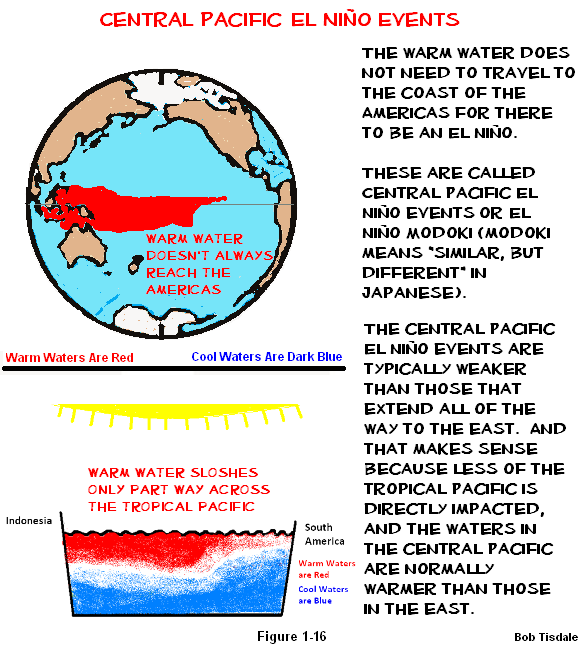 The west Pacific Warm Pool holds a massive amount of warm water. It varies in size. When it’s large, the west Pacific Warm Pool can cover a surface area of about 19 million square kilometers (7.3 million square miles) but it averages about 12 million square kilometers (4.6 million square miles). Numbers that large are hard to embrace, so, when the west Pacific Warm Pool is larger than normal, think of an area the size of Russia or a little less than twice the size of the United States. Refer to the Mehta and Mehta (2004) presentation Natural decadal-multidecadal variability of the Indo-Pacific Warm Pool and its impacts on global climate. Also imagine the warm water reaches depths of 300 meters (about 1000 feet). 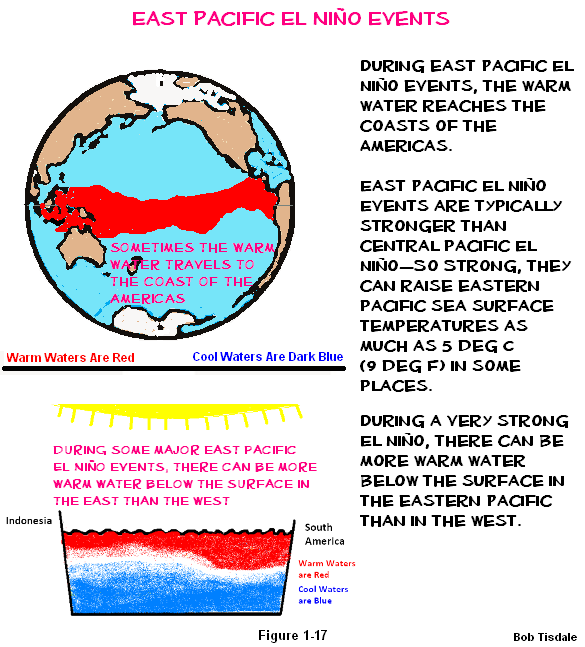 Sometimes, during a very strong El Niño, most of that water from the west Pacific Warm Pool will be transported east and much of it will spread across the surface of the central and eastern tropical Pacific. Now remember that the Pacific stretches almost halfway around the globe at the equator. An El Niño dwarfs all other weather-related events. How big are they? Sometimes it takes a pair of tropical cyclones just to trigger an El Niño. Yes, tropical cyclones as in hurricanes. Let’s return to the ENSO-neutral phase for a second. A weather event—for example, a couple of tropical cyclones or a pair of them that straddle the equator—a weather event that’s teeny by comparison, has caused the Pacific trade winds to relax, which in turn has unleashed a monstrously large phenomenon that is capable of raising global temperatures 0.4 degrees C in less than a year. In turn, there are heat waves and cold spells. Floods will strike some parts of the globe. Drought conditions form in others. Snowfall will pile to record heights in some areas, and in others it will decrease. These effects were studied and documented decades ago, and they’re still being studied, for example, to account for differences between Central Pacific and the more powerful East Pacific El Niño events. Of course, some publicity seeking climate scientists continue to (very unwisely) blame carbon dioxide for the heat waves and cold spells, flooding and drought, blizzards and low snowfall, creating further disbelief in climate science. They have only themselves to blame for their loss of credibility. I digress. Back to the cartoon-like illustrations. 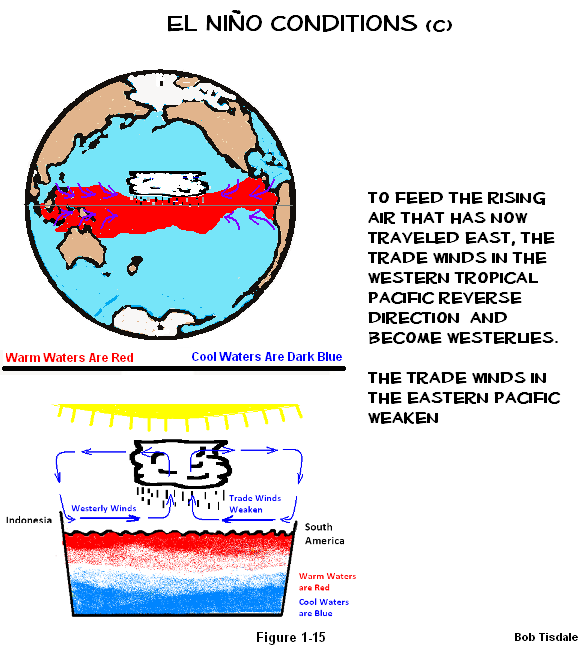 Trade winds cause the sea surface temperature and height in the western tropical Pacific to be greater than they are in the east. 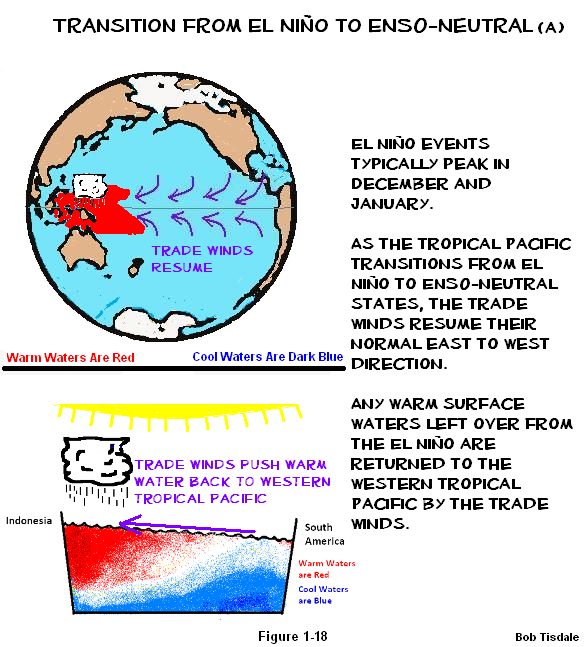 El Niño events are started by the weakening of the trade winds. 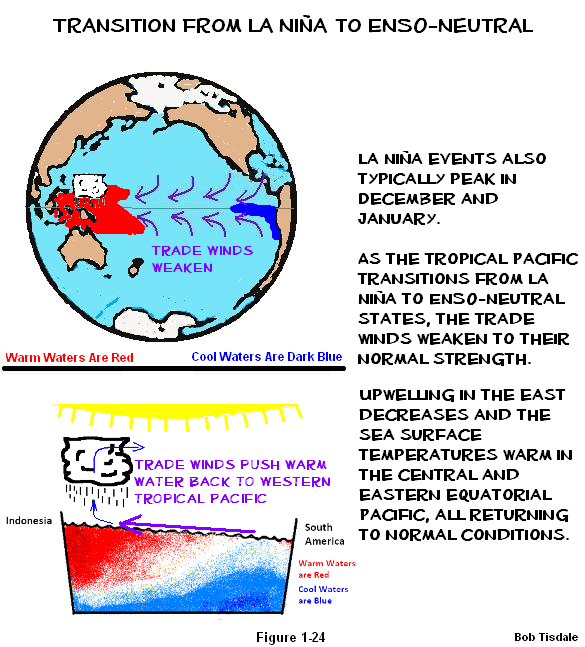 The weaker trade winds can no longer hold the warm water in place in the west Pacific Warm Pool, and this allows gravity to carry the warm water east, raising sea surface temperatures in the central and eastern equatorial Pacific. 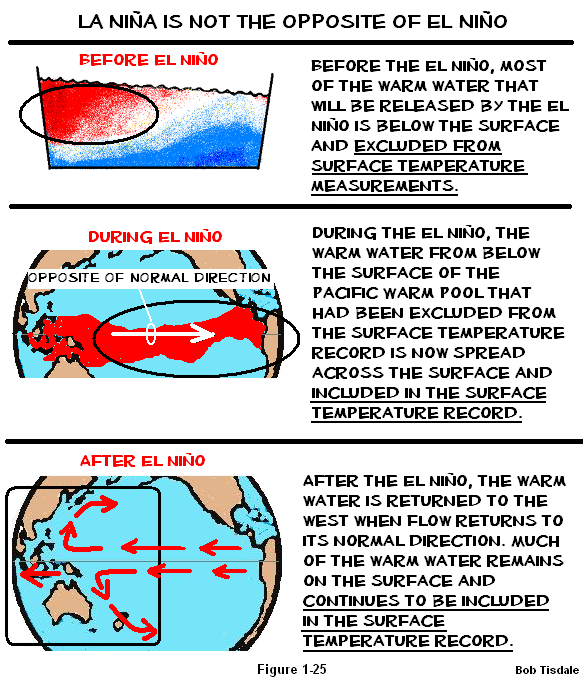 El Niño events are the abnormal phase of ENSO. 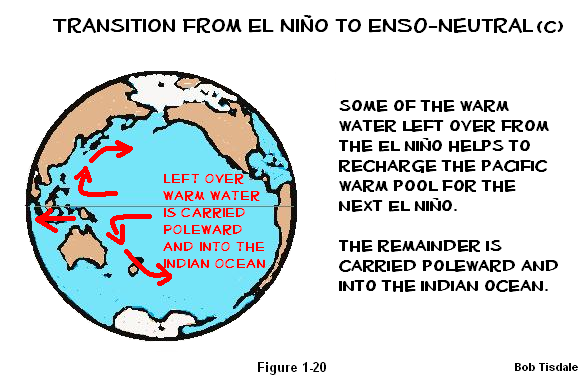 The Equatorial Countercurrent strengthens and carries a large volume of warm water from west to east, and that increased volume from west to east opposes the normal east-to-west flow during ENSO-neutral and La Niña phases. The winds also change directions during an El Niño, with trade winds becoming westerlies in the western tropical Pacific. On the other hand, during ENSO-neutral and La Niña phases, the trade winds are blowing in their normal east-to-west direction. La Niña events are easy to describe. They are exaggerations on the ENSO neutral phase. 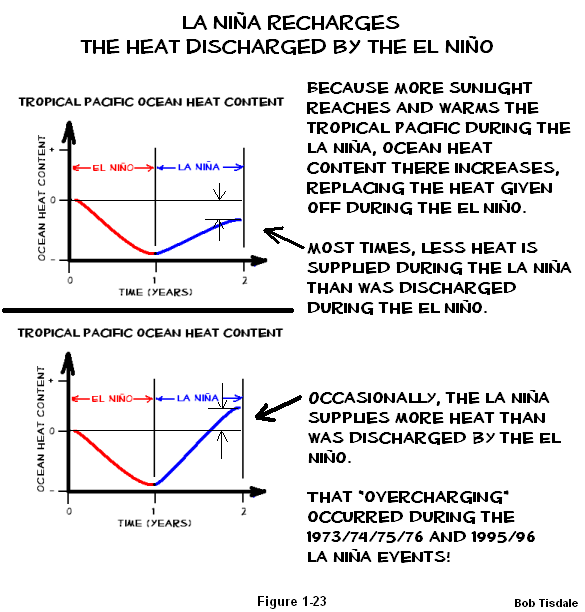 However, La Niña events play the important role of replenishing the heat given off by the El Niño that precedes it, and sometimes a La Niña can create more warm water than was released by the El Niño. Warm water that has traveled east during the El Niño and that is not “exhausted” by the El Niño does not remain in the eastern tropical Pacific. It is returned to the West Pacific and Indian Oceans, where much of it remains on the surface. Before the El Niño, most of that warm water is below the surface of the west Pacific Warm Pool and excluded from the surface temperature record. Then, after the El Niño, part of what remains of that warm water is now on the surface of the West Pacific and East Indian Oceans. 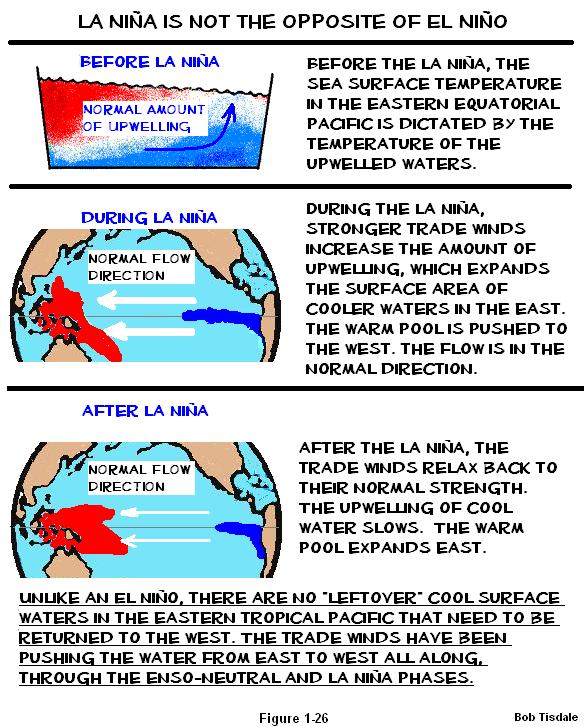 The opposite does not occur during the La Niña phase. The result: strong El Niño events can raise global sea surface temperatures for extended periods of time. This will be discussed in detail in Section 5. Again, if you have any questions, please ask. Now that you’ve run through the processes, here’s a one sentence description of ENSO: ENSO acts as a chaotic, naturally occurring, sunlight-fueled, recharge-discharge oscillator, where the La Niña phase acts as the recharge phase and El Niño acts as the discharge phase. As long as the climate science community continues to treat ENSO as noise, they will make little progress in understanding the natural contribution to global warming, and it’s a sizeable contribution. We’ve discussed for years that the climate science community has failed to account for the “leftovers”, the residual warm water, from strong El Niños. I also used those cartoon-like illustrations in my two-part video series “The Natural Warming of the Global Oceans”, which first aired on the WUWT-TV special in September 2012. That series is available on YouTube. Part 1 is here, and Part 2 is here. 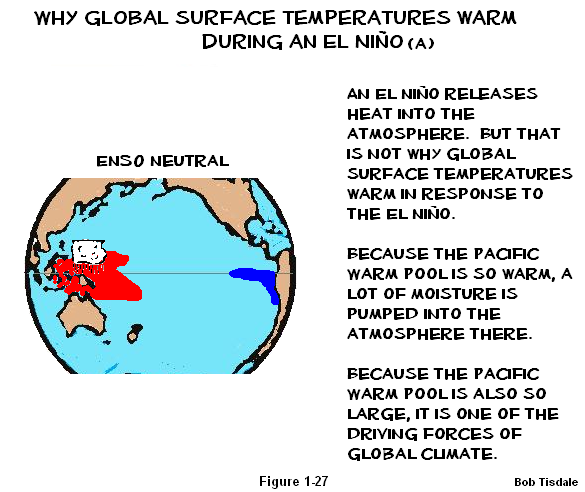 I went into much more detail to explain ENSO processes and the aftereffects of El Niño and La Niña events in my ebook Who Turned on the Heat? I’ve lowered the price of Who Turned on the Heat? from U.S.$8.00 to U.S.$5.00…for a month or so, with hope of increasing sales a little bit. A free preview in pdf format is here. The preview includes the Table of Contents, the Introduction, the first half of section 1 (which was provided complete in this post), a discussion of the cover, and the Closing. Take a run through the Table of Contents. It is a very-detailed and well-illustrated book—using data from the real world, not models of a virtual world. Who Turned on the Heat? is only available in pdf format…and will only be available in that format. Click here to purchase a copy. Thanks. Unless I can find funding for my research, it will be book sales and tips/donations that allow me to return to blogging full-time. I’ll be off to work in a little while. I’ll be available to answer questions this evening and over the weekend. In addition to all the things you have noted that ENSO controls, include the rate that tropical thunder clouds pump CO2 from the sea surface into the stratosphere where it is rapidly distributed toward the poles. The temperature gradient in these clouds is controlling the concentration that goes out the top. There is a very strong correlation between tropical air temperatures and the year to year atmospheric CO2 concentration change rate. Significant is the observation that it lags the temperature change indicating it is not causing significant warming but may be a good lagging indicator of climate change. Thanks Bob, an excellent article! The right amount of simplification and good illustrations. You’ve not mentioned the Coriolis effect, which is pertinent, in varying degrees, to both oceanic and atmospheric phenomena. Surely the differentiation between La Nina and El Nino is a balance between Earth’s rotational factors and insolation factors? With all due respect Bob, most ‘brief introductions’ result in previously ‘non-disclosure material’ argument. This is a good way to promote your book, but bad for discussion over the internet. You’ve not referenced this here (evidence please). The ‘prime mover’ for oceanic and atmospheric circulations is Earth rotation. The ‘main force’ being ‘Earth centrifuge’, where ‘other’ forces introduce their proportionate ‘forcings’. IMHO you’re not in full dialogue here, but I listen in hopes. section 1 is an excerpt of the book. Should Bob rewrite it to fulfill your curiosity? If you’re really interested in this why don’t you buy this book? Now it it’s price is reduced to 5$ Is this too much? And finally – what’s bad about promoting this book? Can you imagine how much work Bob has invested in the last years to inform you and me? Better not to calculate the hourly wage for this. I have bought all 3 books and I am very thankful having learnt so much from Bob. Thanks for the post. It was thoroughly interesting and informative. Bob: Do you know if climate models take into account the changes in sea levels that are associated with ENSO? Frank, I do not know for certain one way or the other, sorry. This was wonderful. Very clear explanation of a topic I ‘sorta’ understood, but now really understand. Bob: I tried to do some reading about what factors are taken into account in AOGCMs. It is clear that modelers work with “geopotential height” and track the “sea surface height anomaly” in their output, but I didn’t find any discussion of the factors that go into changing the sea surface height. Satellite measurement of SLR have resulted in two decades of well-documented sea surface height anomalies. Local anomalies are associated with variations in atmospheric pressure and meso-scale eddies, but I didn’t find a discussion of how well models reproduce the type of anomalies that are actually observed. I suppose that AOGCMs are being driven by all of the physics that controls sea surface height anomlies, but it would be devastating to credibility if an important factor like this was missing. Frank, thanks for researching the sea surface height aspect of ENSO in climate models. Bob, I didn’t mean to imply that my limited research was definitive. It would be interesting to know just how GCMs account for the effect of winds on changing sea level. This has to be done where the atmospheric and ocean modules are merged. do you know the “Earth Wind Map”? This online tool visualizes animated wind and currents for the whole world in a GoogleEarth like style. With the mouse buttons you can rotate and zoom the Earth. With a control panel (click on “earth” on the lower left) you can specify what you want to see. You can vary the height from sea level up to the stratosphere. The wind data are updated every 3 hours, the currents data every 5 days. Isn’t it great? I think it fits perfectly to your chapter explaining trade winds and ENSO phases. Thanks very much for finding that website, Werner. Thank you Bob for one of the most informative articles I have read here. 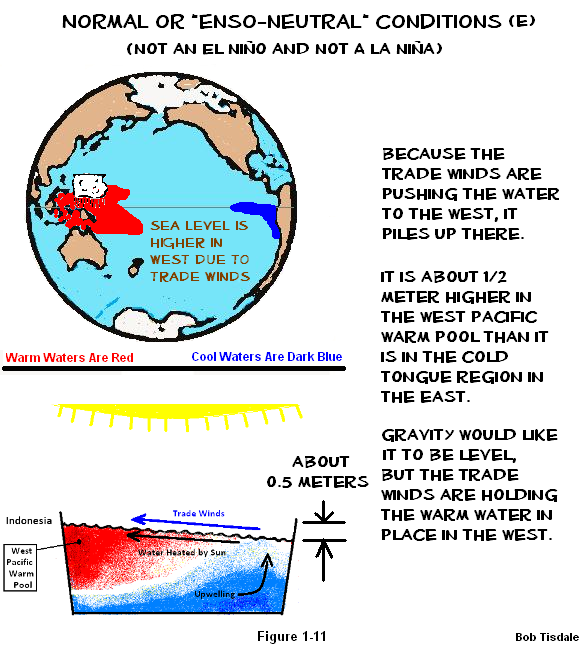 Prior to reading this I did not have a clue about El Niño and La Nina. I visited western USA a few weeks ago and the Pacific was warm and comfortable to swim in, contrast that to the North Sea which is only 20 miles away from where I live where it is cold all year round. 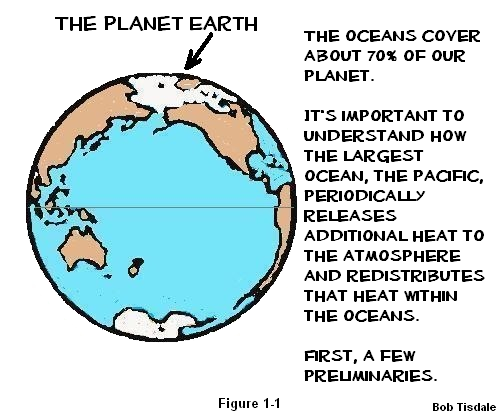 Since water (especially seawater) has 1000’s of times the specific heat capacity of air, and due to the size of the Pacific, it is common sense that it will have a world wide influence on both climate and weather. I gather California has a blocking are of high pressure off the coast, preventing rain from falling, and the jet stream which seriously affects our weather here in UK is North of our islands, pulling in wet, mild and stormy weather from the equatorial Atlantic. Meanwhile the jet stream over central and Eastern USA is to the South, snaking North across the North Atlantic towards us. Would I be right in saying that weather is about extremes and climate about averages? In other words the floods in SW UK will eventually be replaced with drought, the very cold snowy conditions in the USA be replaced with dry hot weather and the drought in California will be replaced with rain? I might appear to be stating the obvious, but when you hear Slingo from the Met Office, most of our politicians and many of yours, you would think that AGW was a reality. At no point during this extreme (not unprecedented) weather has anyone actually mentioned that global AVERAGE temperatures have not changed for almost 18 years and the Sun is billions of times more influential over the climate than CO2. I wanted to congratulate you for a superb presentation. Masterful!